Reaching holy city of Madinah is quite in your life, as you get a chance to visit purest place on earth. Spending few days here in the company of near and dear ones for visiting Prophet’s Mosque and other tourist attractions is nothing but heavenly journey of spiritual significance and utter peace and tranquility. In order to make this journey go all the comfortable and memorable, get set to put your best feet forward inside Al Shourfah Hotel Madinah. This is the perfect example of class, luxury, splendor and grace that one can experience in a pocket friendly manner. A centrally placed hotel in Medina is simply majestic for its monumental persona, unbeatable mix of Arabic and modern interior inside along with mouth-watering dining experience. 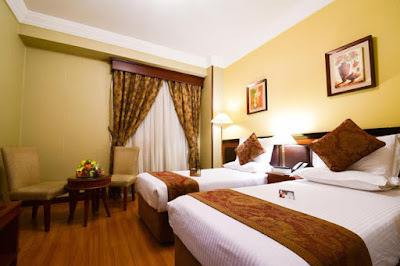 Surely, you are going to embrace luxury at its best, while having a relaxed position inside plush looking rooms. Ideal glimpses Arabic architecture and artwork is best displayed on bedding. Vintage style wooden floor bring fascinating appeal to the eyes of guests. Plus, amenities to find inside are air condition, free Wifi, refrigerator, flat screen television, shower in bathroom and much more. 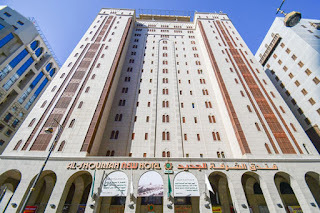 One, who has real consideration with the location, will find this ultimate lodging settled just 150 meters away from Masjid Al Nabawi. Plus other places like, Dates Market(3Km) and Mount Ahad(4Kms) are located in the close vicinity of the hotel.